Press the (display/information) button repeatedly until the appears. Press and hold the ENTER button for about 10 seconds to enter the reset mode. Press / to select a maintenance item to reset, or to select All Due Items (You can also select Cancel to end the process). Press the ENTER button to reset the selected item. Repeat from step 4 for other items you wish to reset. 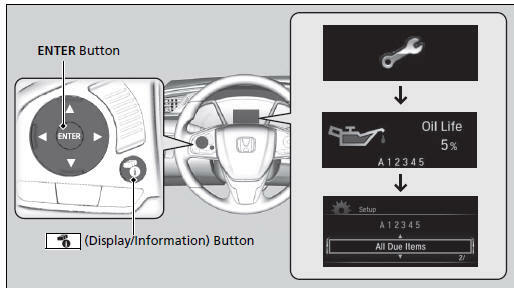 You can also reset the Maintenance MinderTM display using the audio/information touch screen.